The teaser of the biggest movie of the summer Maharshi starring Superstar Mahesh Babu is out. just like the posters, the visuals too bear the extreme stylish mark all over it. The teaser besides being stylish is also to the mark. It tells the underlying vibe of the movie along with a glimpse at the writing. The two dialogues are neat and leave fans wanting for more. The second one, especially on success, will strike the right chord among the fans. On the downside, there is a bit of laboriousness and monotony on display. Also, the change that fans are so desperately waiting to see is not going to be present here; the teaser makes it clear. Check out the teaser below. Vamshi Paidipally directs the movie which is the landmark 25th movie of Superstar Mahesh Babu. Pooja Hegde and Allari Naresh play other vital roles in the commercial entertainer. Maharshi hits cinemas worldwide on May 9th. 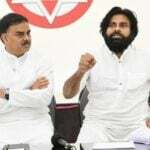 Next articleఇది పవన్ కళ్యాణ్ మీద ప్రేమా, కాపుల మీద ప్రేమా లేక ఇంకేదైనానా?